If you are planning on spending much of your time camping, it is imperative to ensure that all the supplies are at your disposal to keep you dry and warm. When considering your accessories, your sleeping bags should be top of the list since hiking and camping involve spending several nights outdoors. Part of enjoying your outdoor escapades involves finding the best cold weather Sleeping Bag to keep you warm during cold nights. You also need to consider where you are going, the weather conditions in that area, and what tents and sleeping bags you would carry with you. You will also need other aspects such as weight and temperature ratings, especially when you will be carrying the bag or extended periods. A warmth-to-weight ratio will help you make a decision about the right gear to pick. This ratio determines the effectiveness of an insulation and measures it against the weight. For instance, if the bag utilizes down clusters of high quality, then in principle, the gear will be very light and warm. Nevertheless, if it uses less expensive materials for insulation, it can still create the warmth needed, but will require much more insulation so as to achieve the same temperature rating, implying it will be relatively heavier. 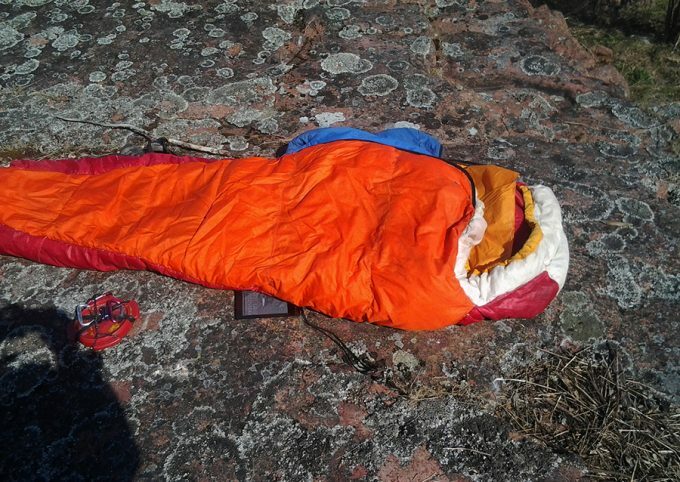 In this review, we are going to go over the important details you need to know before you purchase a sleeping bag for cold weather. Also, we are going to give you several reviews, so you can see what is available and see what features might work for you. Now, let us dig in! Getting a beautiful night’s sleep while out on your hiking adventure comes down to three primary things: a shelter from nature’s element, a barricade between you and the earth, and a means of insulating yourself from the cold. For you to achieve these aspects, you will need to have a ground pad and an excellent sleeping bag. The right bag for your outdoor expeditions should cover you in a cocoon of comfort and warmth, making it possible for your body to recover so it’s ready for another hiking day the following morning. 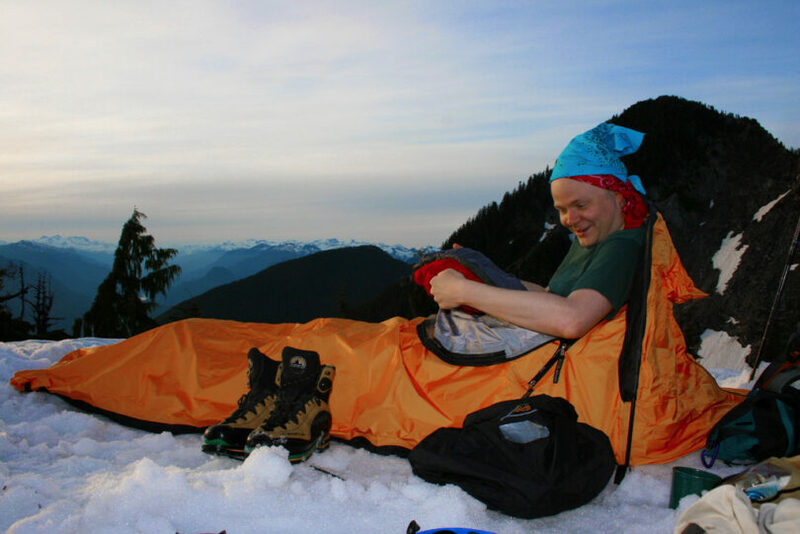 We understand that finding a suitable sleeping bag can be an overwhelming task for anyone. However, the features below will help you narrow your choice to what you may need. When searching for a sleeping bag, it is important to consider the various levels of insulation available. Some manufacturers refer to this aspect as the ‘comfort limit,’ while others call it the ‘season rating.’ This refers the minimum temperature that would allow you to have a safe, comfortable, and undisturbed sleep. It is reasonable to buy a bag that provides a season rating slightly below the temperature you will be expecting. 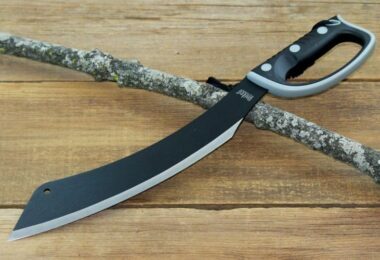 This will allow some degree as insurance, so you may sleep comfortably when you are out in the wilderness. 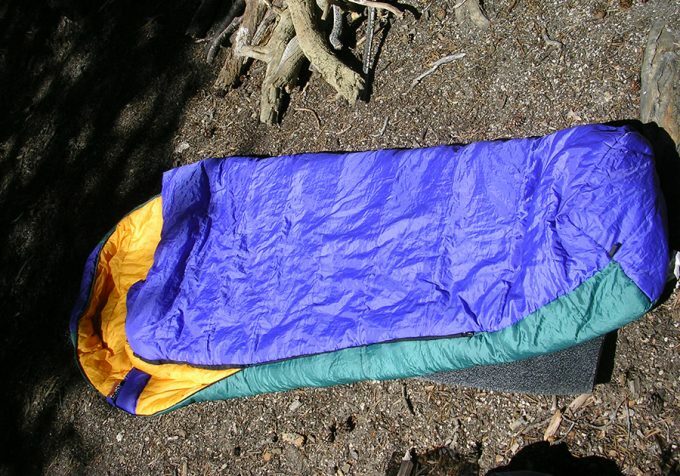 The issue of insulation is significant when it comes to finding a cold weather sleeping bag. There are two types of insulation offered – synthetic and the down insulation. The down gears have a longer lifespan and are known to have a better warmth to weight ratio, aspects that make the bags ideal when a smaller and lighter pack size is needed. Nonetheless, down can be costly and require more maintenance. Storage must be done with care as a long time compression of the bag squashes its down clusters. Additionally, this type of bag must be kept dry to prevent the clusters from sticking together, destroying their insulation properties. The synthetic bags do not need a great deal of maintenance. However, they have a poor warmth to weight ratio and are not so easy to compress. A good thing about these bags is that they are able to retain their insulation properties even when exposed to moisture. The synthetic bags are an effective and durable alternative. What is more, as technological advancements continue to take place, their pack size and warmth gets closer to the down’s aspects. 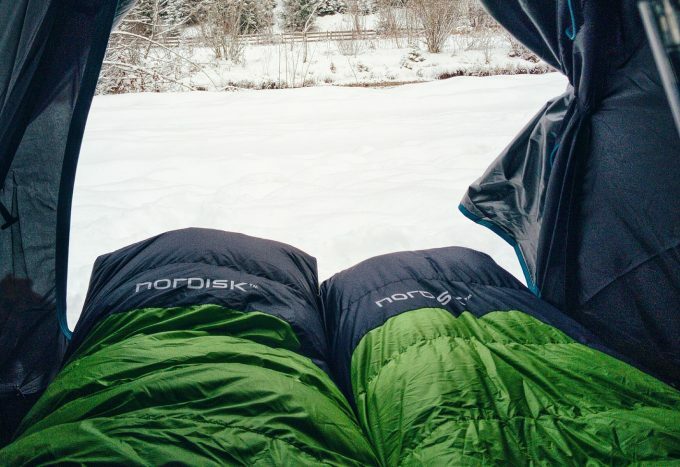 Cold weather sleeping bags come in different sizes and shapes, and for a good reason. A bag that leaves a small space once occupied is more effective at retaining heat compared to the one will a larger space. Nevertheless, there is a faint line between comfort and space, and being warm enough for an excellent night’s sleep. We have now reached the part of the review where we do actual reviews! Below, you are going to find several reviews of sleeping bags that will work in cold weather, even down to negative temperatures! Read on to find the best sleeping bag for you! 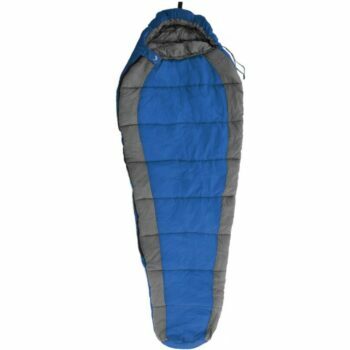 Description: The Coleman North Rim Mummy sleeping bag is an amazing camping and hiking gear with all the features you would expect from a bag as technical as this. 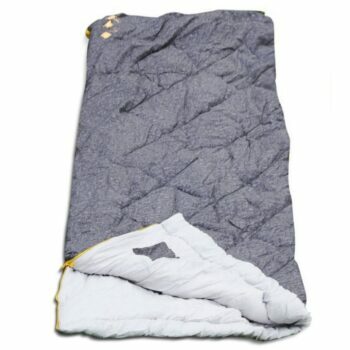 Its offset quilt design is outstanding as it helps get rid of cold spots. The inclusion of a semi-sculpted hoods will help keep your head warm. The chest baffles are constructed such that they are able to hold the heat inside the bag. At full length, the insulated draft tube keeps out the chilly drafts. The bags are designed with a 2-way zipper to provide maximum ventilation. 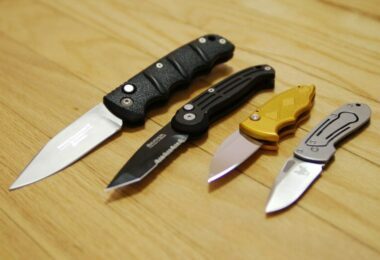 Its weight of less than four pounds, makes it an easy to carry gear so you will not get excited in the middle of a hike. Users enjoy this sleeping bag not just for the affordable price, but because it is light weight, easy to take along with you, and has the semi-sculpted hood. Overall, users would recommend this sleeping bag to family and friends! Related: When camping, you may need to move around in the dark at times. If so, you could invest in a headlamp such as one like the LE Headlamp LED, 4 Modes Headlight. Description: The Country Squire sleeping bag will provide you with the ultimate hiking and camping experience as a result of its warmth and comfort. 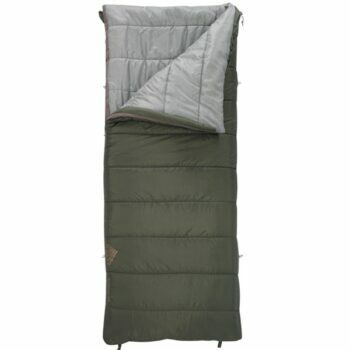 Its double bag compatibility allows for zipping of two bags together so as to form a double sleeping bag. The County Squire will slide you back to the simpler times with its flannel lining and sturdy canvas. Updated with the latest comfort foot box, the bags are comfortable, warm, and hardy, giving you the utility you deserve. While the price for this sleeping bag is a little steep for some, keep in mind the great features that this sleeping bag has. From the quality materials of cotton duck and flannel, to the ability to zip 2 of the same bag together, makes it worth the extra money, for sure! Not only that, but when the cold weather gets down to 0 degrees, and the wind is blowing, you will be happy to have this incredibly warm, durable, sleeping bag that includes a Buffalo Plaid Flannel Liner! Related: If you like to include a pillow while you use your sleeping bag, you can look into one such as the Nemo Fillo. It is easy to pack and use, and comes in a variety of colors. 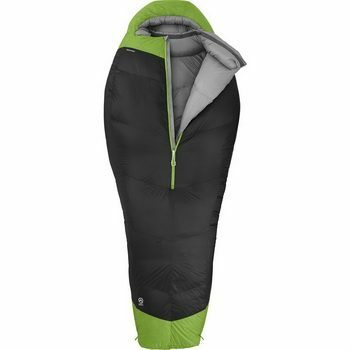 Description: The Teton Sports Celsius sleeping bag is filled with the SuperLoft hollow-fiber insulation that helps to lock out the chill during spring, fall, and summer evenings. It is accompanied by many different features to help you adapt to your outdoor environment. It is imperative to know about its temperature rating before you can make the decision to buy. When a bag is rated 0O by the manufacturers, it implies that the bag will prevent you from freezing even in zero degree weather. For hiking and camping gears, temperature ratings are the survival and not comfort rating. For the latter, get a sleeping bag that is rated fifteen to twenty degrees colder that the night temperatures you will be expecting. If you require an extreme cold-weather gear, you may consider the Teton Sports – a little bigger yet warmer. The bag comes with 2 zippers on both sides so it can be possible for you to zip two bags together and form a double bag. In that case, be sure to buy a right-hand and one left hand zip. Related: Teton makes a camping pillow that you can use with their sleeping bags. The TETON Sports Camp Pillow is affordable, comes in 4 color options and has a stuff sack! Specific features: ProDown water-resistance, generous mummy cut, internal pocket, NeoVent Air material. Description: The North Face Inferno is the North Face’s warmest adventurous bag and is meant for the harshest environments. The bag has been treated with a ProDown water-resistance process to help maintain heat during the wet weather. Its Neovent fabric adds some additional water-resistance to the back, hood, and foot box for tents riddled with moisture. Its mummy design makes it possible for you to layer up when going to bed, and its centered zipper provides easy entry. 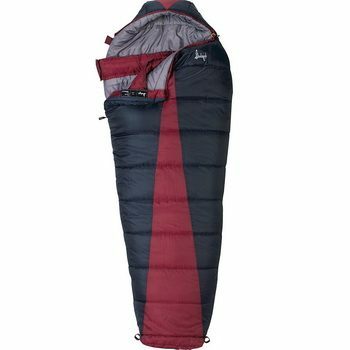 With a maximum user height of 6 foot, 7 inches, nearly anyone can fit inside of this sleeping bag and be warm and comfortable inside. The mummy shape is cozy, too, and users love that it keeps cold air out and warm air inside. Users do not like the big price tag on this sleeping bag. But those who have purchased it say that, while it is a lot of money, you will get your money’s worth in warmth and comfort! Max user height is 6 ft, 7 in. Related: For a warm sleeping bag that is made of Down and is less costly, you can look into the Hyke & Byke Quandary 15 Degree Down Sleeping Bag. 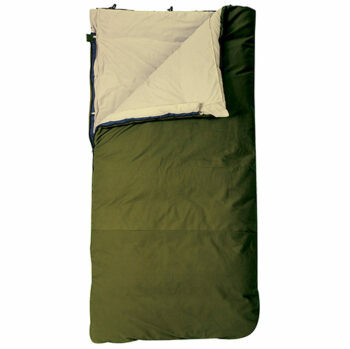 Description: Sleep comfortably from zero to twenty Degrees with the Coleman Big Basin sleeping bag. The gear offers a roomy design for tall (up to six feet six inches) and big individuals. Its draft tubes help to lock heat and prevent loss through its zipper while the fleece foot creates additional warmth at the bottom. Its quilting construction gets rid of any potential cold spots, giving you a warm and cozy night after a long day’s hiking. In case it gets too warm inside, the two-way zipper allows you to unzip the bottom for some extra ventilation. The bag includes a stuff sack for your storage needs. With its quality materials like Polyester, affordable price, and ability to ventilate when you are warm, this sleeping bag has a lot to offer besides keeping you warm in cold weather. Users like the option for big and tall designs, and the sculpted hood, which keeps your head warm and cozy. Related: Some campers like to have a sleeping pad, and finding one that is comfortable and affordable is hard. That’s why we have found the Therm-a-Rest RidgeRest Classic, which is light, affordable, and made in the USA. Description: Slumberjack is well aware of the significance of a quality vacation to a family. The Slumberjack Latitude sleeping bag is loaded with numerous features such as the water repellent shell and the Slumberloft insulation to make your camping nights amazing and memorable for the right reasons. These bags are designed such that they are able to retain warmth in the interior by fitting its contours in your body and at the same time provide enough space to give you the comfort you deserve after a long day’s hiking. It is fitted with daft collar that prevents the loss of heat from the shoulder and neck area. To ensure a reliable operation of the zipper, an anti-snag protection is fitted along with the draft tube that helps in keeping out the cold air and preventing the loss of heat along the zipper. The Trapezoidal foot box offers space for your feet to give you the comfort you deserve. A stuff sack is included for your storage needs. 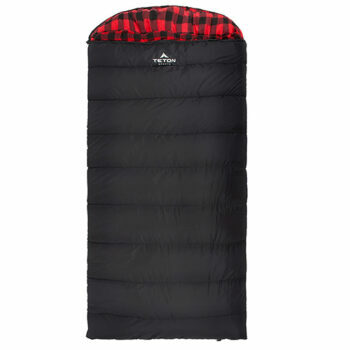 Related: For a more affordable option, you can find one that keeps you warm, with better quality, like the TETON Sports TrailHead +20F Ultralight Sleeping Bag. Description: Spread out your gear and get comfortable. The Kelty Callisto Sleeping Bag has been designed to take on different seasons and provide big time coziness with its super loft CloudLoft insulation. With its rectangular and roomy size, the bag offers you the versatility to snuggle up together with your significant other. Just zip two bags together using the Callisto full-length zippers and what you get is a double wide bed in a flash. In the case of heat, you have the alternative to unzip the bag and transform it into a blanket, thanks to its versatility aspect. 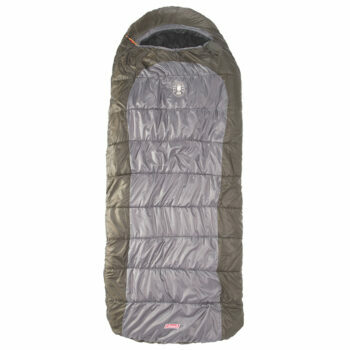 Overall, users would recommend this sleeping bag to family and friends, for outdoor adventures! Related: SlumberJack makes their own line of camping pillows that comes in different sizes and colors. You can find one such pillow, like the Slumberjack Slumberloft Camp Pillow. Description: The Tribe Provisions Mummy sleeping bag was designed to keep you warm throughout the night without breaking your back. The synthetic stuffing maintains the heat, keeps the bag form, is resilient and light as well. It is engineered for use in temperatures below thirty-two degrees. With the Three Season, you are able to sleep under the stars or in a tent, or even carry it to the Adventure Hammock for a great night’s rest. When packed, this bag weighs 2.8 pounds and shrinks down to 8” x 8” x 16”. Another good thing about this sleeping bag is that it is machine washable. This is an excellent feature as you will be using it outdoors. The manufacturers of this bag guarantee a fantastic experience with their products as they are keen on every detail. The stuff sack comes attached to the back of the back and can also be zipped up to keep it out. An interior zipper pocket has been added to store your gadgets and cash during the night, getting rid of the morning confusion of “Hey, have you seen my keys?”. Related: Lots of campers like sleeping pads, and the Klymit Static V Lightweight Sleeping Pad fits inside of this sleeping bag perfectly! It is a little pricey, but it is comfortable and will keep you sleeping through the night. 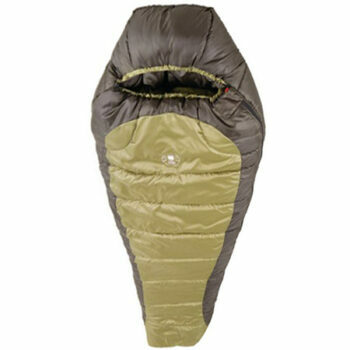 Description: The Ecoopro Cool Weather Sleeping Bag is an excellent sleeping bag for colder weather. It has a smooth zipper which opens on both ends, making it possible for you to use it as an outdoor gear to keep you warm without necessarily taking off your boots. Its liner is smooth and soft polyester with the exterior being a smooth-textured nylon. On the downside, this bag comes with a pillow-type pouch and not the usual stuff sack you may expect. However, this is not a deal breaker, especially if you are planning to use the bag for a sleepover or slumber parties, but if you are embarking on an actual backpacking tour, a compression sack would certainly be a suitable option for you. However, this waterproof sleeping bag is easy to take with you, affordable, and works down to 50 degrees F, which is perfect for camping, hiking and other outdoor adventures! Related: We found a sleeping pad that has a built in pillow that will work for this sleeping bag. The Intex Inflatable Fabric Camping Mattress with Built-In Pillow is comfortable and highly affordable. 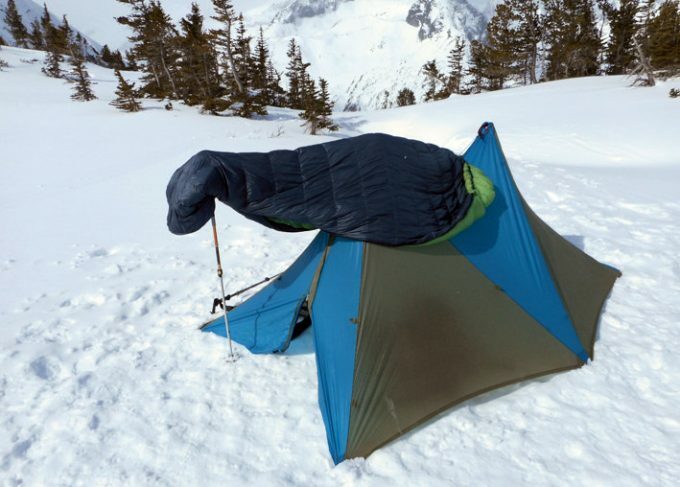 When planning your outdoor expeditions, it is imperative to remember that cold weather camping could be dangerous. Since you will be outdoors in an uncertain weather, you will need to ensure that you are always warm. This implies using some shelter or cover along with your cold weather sleeping bag. It does not have to be a trailer or a full camper, but it is recommended that you get some type of canopy or tarp over you in order to protect yourself from the wind. Apart from that, make sure you are taking all the necessary precautions to keep you warm and safe during the cold weather trips. This is the time when you are prone to respiratory illnesses so make sure you are keen on what your body needs when sleeping through the night. In case the weather is too cold, it is advisable to combine your sleeping bag with some kind of shelter such as a tent. So, have you ever purchased a cold weather sleeping bag before? Please let us know what your experiences have been so far. You can do that by leaving your views in our comment section below. If you have any question regarding sleeping bags, feel free to ask and we will be more than willing to answer them. Best Bear Canister: Saving Your Picnic Basket!